You know where I got the recipe for the shells? A calendar hanging near the bathroom in my apartment. My boss gave it to me in the beginning of this year, and it has beautiful photos of sweets with recipes. 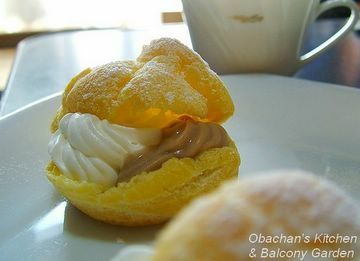 “Cream puffs with chestnut cream filling” was on its October page, and I dreamed about trying it out, staring at the photo while brushing my teeth. Finally, I bought a can of chestnut cream at my favorite store MARCO yesterday, and started my project early this morning. The can says the cream is imported from France. Is this a popular brand over there? To my surprise, the puff shells came out of the oven alright and did not fall. The only thing was that the bottom part was a little tough. But not too bad for a first try… I think. These cream puffs in the autumn afternoon sunshine... And the steam drifting up from the teacup... Oh, it was so very healing. Your cream puffs look delicious! they look great Obachan! I am very jealous. I don't have an oven, so these will have to wait until I return to Australia. So many great things you make I can't - I have to be content with window shopping. Or should that be site shopping? Your cream puffs looks absolutely sinful! Makes me very hungry. :P How do you make them? What recipe did you use? 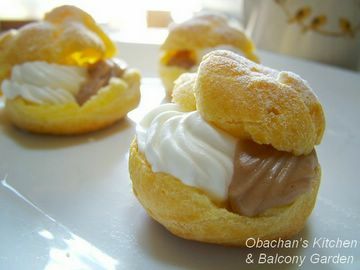 I love cream puffs, and yours look beautiful! Great job! I've never tasted chestnut cream before. I'll have to try it out. Most of my exposure to chestnuts have been the ones I roast over an open fire and salt. Mmm... Delicious! Obachan, save me one, I'll be right over. They look sooo good! I'm also intimidated, but, just maybe, you've given me courage to try. So, sounds like this is not a popular brand over there. Oh well. The cream tasted OK so it’s OK for me. Thank you. :) I think they were not bad for the first try. Thanks. The recipe was from my calendar, and I found this recipe pretty close -- I mean, proportion-wise. But the recipe I used called for a little less water and slightly more flower. Thanks. I wish you could have been here to see how they really looked in the sunshine from the balcony window. 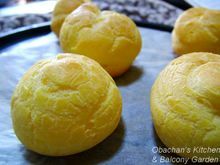 The inside color of the puff shells turned into soft and bright yellowish beige when backed by the sunshine, and it was so healing. I love roasted chestnuts, too. mmm... I always liked creme puffs, and those look positively delicious. 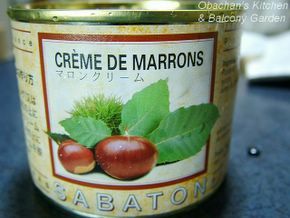 I wonder where I can find that Chestnut cream over here? Oh well.. These have to be some of the best looking creme puffs I have ever seen! Thank you for the info. It’s a very useful and informative site. Hey, it took me a while to get this. I didn't know this originally started in Osaka, Japan, even though I was living in Osaka in 1999. OK, so, maybe I can be a better cream-puff maker if I stop shaving...??? 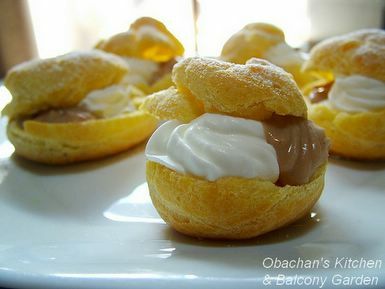 Your cream puffs look better than the pics I have seen in my books of recipes. 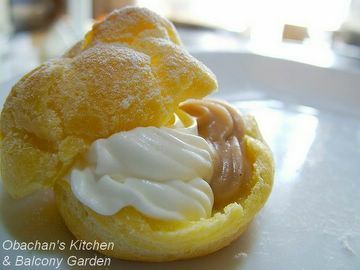 My husband has been telling me that he yearns for cream puffs and eclairs, but I have not had the gumption to try. Please share your recipe! I sure would want to have a good chance of ending up with CPs as good as yours! Thank you so much. As I wrote above in my comment to lysithea, this recipe is pretty close to what I used for making the puff shells. And I whipped the cream following the instruction on the whipping cream package.